Every kid that has seen Back to the Future has instantly wants their own DeLorean. Parents scoff at thae idea and the price but you can be sure the next thing on the kids shopping list is a hoverboard. Then reality sets in as everybody quickly realises that the technology isn't there just yet. Or is it? Well, it all depends on whether you believe what you see on Youtube. An American company called HUVr have just released a video, which has quickly gone viral, of celebrities testing hoverboards. 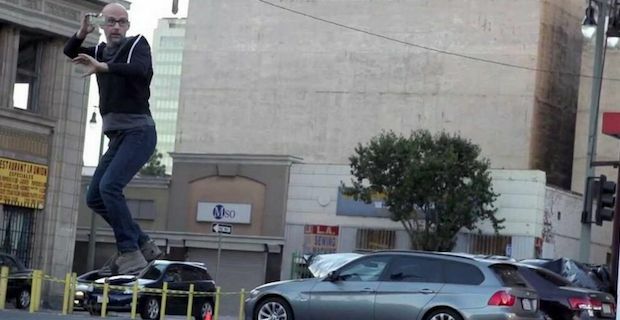 The company claims that the HUVr board creates a magnetic field in order to allow users to skate through the air. The hoverboard has apparently come to fruition after emerging out of a 2010 MIT Physics Graduate Program summer project. Tony Hawk, Moby, Terrell Owens and Back to the Future's Christopher Lloyd all feature in the video that seems to have gotten everybody talking. Billy Zane also gets involved in another video where one of the developers explains to him that "This board has more technology within it than the satellites we sent into space in 2010". But as much as we'd all love our very own hoverboard, the videos true purpose could be to drum up investment for the project or more likely, it is just somebody having fun at our expense. Be sure to watch this campaign closely to see if if is a well crafted marketing event or promotion tool. But when it comes to the HUVr board, our money is on the whole thing either being a promotion tool for the Back to the Future Musical or a highly elaborate prank that plans to run for a while yet. Back To The Future Hoax!